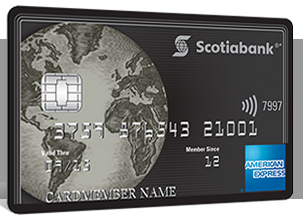 One card that does not get too much attention on our site or many others is the Scotiabank Platinum American Express card. The card is a sleeper card. That is, there is little promotion of it, little talk of it but when you consider the benefits that come with it you can see why we call it a sleeper card. We even reminded ourselves of the card, hence this post, when we released our Ultimate High End Credit Card portfolio a few weeks ago. We did consider the card but in reality the ultimate high end card is the Platinum Card from American Express so that card took the Amex slot for the portfolio. However you could give this card consideration if you don't need all the benefits and the heftier price tag from Amex's own offering. This card isn't cheap as well but it is $300 less than The Platinum Card from American Express. At $399 the Scotiabank Platinum American Express Card falls into the realm of less than 10 cards in Canada that have annual fees over $150. That being said, this card fills a great niche for someone who may be a semi-frequent traveller that only travels maybe a half dozen times per year or so. Why is that? The card offers free Priority Pass membership, a US$99 value. Big deal you say, the BMO World Elite MasterCard and several Platinum Cards from American Express have this feature. However the Scotia Platinum American Express comes with 10 free lounge visits for the primary cardholder and 4 more for a supplementary cardholder. At US$27 a pop that's US$270 in savings for the primary cardholder. So really you have covered your annual fee with just the lounge access. You also get 30,000 bonus points on your first purchase with the card that's worth $300 towards travel. So let's add that up. $300 sign up bonus, US$99 Priority Pass membership and US$270 in lounge passes. That means in the first year you are getting close to $800 in value for the $399 annual fee. Each year after that you're annual essentially covers the lounge costs but then you have your rewards, insurance coverage and other benefits included. This card is actually a steal of deal. Now do you see why consider this card the sleeper card? Not well known, but it really should be seeing how popular the Gold version of the card is. Do you have this card? Are you considering it? Let us know below what you like about it! • Rates, fees and other information are effective as of March 1, 2017. Subject to change. Can the 10 free lounge passes be used by someone else other than the primary cardholder?